Lela Swift, a pioneering female director who started in television’s live era and spent three decades directing the cult soap opera classic Dark Shadows, has died. She was 96. Swift won three Daytime Emmy Awards for her work on another daytime serial, Ryan’s Hope. She died peacefully in bed Monday, July 27, in Santa Monica, according to Starz Entertainment, where her son, Russell Schwartz, serves as senior vice president of business and legal affairs. Schwartz is a TV producer who has worked on Unsolved Mysteries and Good Morning America. In 1966, Swift joined producer Dan Curtis on the gothic serial Dark Shadows, which was filmed in a tiny New York studio. The spooky ABC show, which starred Jonathan Frid as vampire Barnabas Collins, lasted 1,225 episodes, and Swift directed 580 of them. “That was the kind of show where you could really lose your mind because every week you had to keep that door creaking,” she once said. 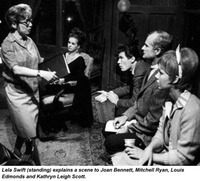 In 1975, Swift then joined the new ABC soap Ryan’s Hope, where she directed 829 episodes, all of them except one through 1981. A native of New York, Swift started her career in the early 1940s as an assistant in the research center at CBS. She rose from gofer to writer and then to assistant stage manager under the guidance of Frances Buss, another groundbreaking female TV director. In 1948, as CBS expanded nationwide, Worthington Miner, who ran the network’s drama department, brought Swift to the dramatic anthology show Studio One as an assistant director. She later directed a two-part adaptation of Louisa May Alcott’s Little Women in 1950 that starred Nancy Marchand. Swift also directed installments of Suspense and The Web; on the latter, she insisted that James Dean, then a young, temperamental actor, remain in the cast despite producers’ efforts to fire him. “The minute he started reading,” Swift recalled, “I knew that boy had something special.” In the 1960s, she directed at NBC’s The House on High Street, a series of multi-part stories about such social issues as divorce and juvenile delinquency, and several public affairs specials. Source: Mike Barnes, The Hollywood Reporter, August 5, 2015.